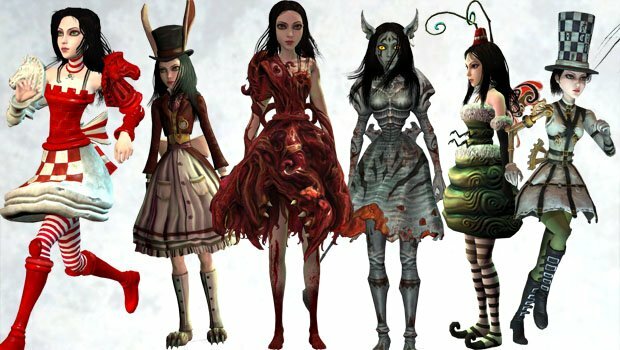 Electronic Arts tossed over a look at the launch-day downloadable content for Alice: Madness Returns. As is becoming increasingly commonplace, the content consists of alternate costumes for Alice to muck about Wonderland in. They each have a different effect on the game, increasing weapon damage or stopping enemies from dropping health items. You can check out the gallery below for a better look at each. I know that a lot of people really hate this sort of stuff. I find it largely inoffensive. I think that if we just resolve to not buy this stuff, it will either continue to be made because there is some audience out there who responds to it or it'll stop. As long as I'm not feeling deprived of something valuable in the game by being asked to pay for an additional feature, it's hard for me to be upset. The "Weapons of Madness and Dresses Pack" is available for $1.99 on PlayStation Network and 160 MS Points on Xbox Live Marketplace.